-All our Florida vacation rental homes in Orlando are privately owned and maintained to the highest standards. -Privately owned homes in Orlando offer a lot more space than a hotel room, and at a comparable cost; home rental rates are for the house not per person. -Orlando vacation home rentals have many personal and convenience items to increase your comfort. -Private vacation home rentals offer excellent flexibility for you. Unlike an hotel room, rental homes in Orlando include full kitchen facilities along with lots of other amenities. -Vacation rental homes and villas have their own private pools, decking and lounging areas. -All the rental homes advertised on our site have air conditioning for your comfort. -For our Orlando home rental guests, we offer check-in and personalized registration, care rental, theme park and dinner reservations, rental of BBQ grills, cribs, communication devices (walkie-talkies), etc. All our Orlando vacation rental homes advertised on Sunstate Rentals website are located within easy driving distance of Disney's main gate, tourist attractions, shopping and the main route to the Orlando airports. Whichever Orlando home you decide to rent, we know you will enjoy our accomodations and surroundings. Let us thrill you with your Orlando Home Rental! Sunstate Home Rentals, Orlando Florida is proud to <offer the finest Orlando vacation home rentals> for you and your family! All of our home rentals are located just minutes from Disney, shopping, theme parks and premier golf courses. Our Orlando home rentals feature private pools for relaxing after a long day at the parks and many include game rooms, home movie theatres and resort style amenities. For your family’s enjoyment, our Orlando home rentals often include tennis courts, play grounds, club houses, swimming pools, basketball and volleyball courts, fitness centers and game rooms. Renting out Orlando homes in standard, executive and premier classifications with 3-7 bedrooms, we have home rentals to fit any family or group need. View some of our <Orlando Home Rentals here>. We have many home rentals than are listed on our site—please let us know your preference of size and amenities and we’ll provide personally selected homes for you. Thousand Oaks is a great community that offers 3 – 7 bedrooms in the closest proximity to Disney World - less than 10 minutes away. These homes all have private pools and are fully furnished with fully equipped kitchens, (some with) multiple master bedrooms hot tubs and gamerooms. This community has plenty of gorgeous trees and sits on a large lake. Close to Disney, gorgeous homes-- the perfect combination for the perfect relaxing getaway in the Orlando area! Westridge is a quiet peaceful neighborhood that has close access to Disney. Gorgeous homes from 3-7 bedroom, it hosts rolling hills and neat clean homes. All homes are fully furnished with gorgeous private swimming pools and enclosed pool areas, perfect for morning coffee and tea or afternoon refreshments after an exhausting day at an Orlando themepark. Homes are fully equipped with everything you need- linens, cookware, full size appliances-- all the comforts of home in a community you'll love. Golf enthusiasts can enjoy golf at Highlands Reserve, the community right next door. Tuscan Ridge is a prestigious community with excellent access to major motorways to Orlando and theme parks. Newly built, it is quiet and provides all the amenities you'd want in a vacation community. Some homes are located on a conservation area, allowing you the ultimate in privacy and peaceful elegance. Clean, new, it's a great community to enjoy your fully furnished vacation home in Orlando. Santa Cruz prides itself on its tranquil location. All the houses are beautifully designed both externally and internally and it is situated among the orange groves to the east of U.S. highway 27. The Disney attractions are a mere 10 minutes drive away and all the other theme parks, such as Universal Studios are all reachable within 30 minutes. The Highlands Reserve Golf & Country Club is a sought-after golf community. With nature trails, clubhouse, beautiful rolling hills, it is a gorgeous place to stay. It has gorgeous 3 to 7 bedroom private pool homes. In addition to the amenities included with each individual vacation home, you can also enjoy a playground, tennis courts and community pool. Easy access to Disney, grocery stores and restaurants yet secluded in it's own preserve, it's a wonderful place to enjoy your Orlando vacation getaway. 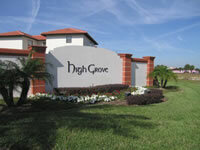 High Grove is a beautiful new gated community with 3 to 6 bedroom vacation homes. With a gorgeous community center that has internet access, a community pool with kiddie pool, playground and fitness room, it offers all the amenities of the perfect getaway in the Orlando area!